WATERHEN (RAN), 30th June 1941, Eastern Mediterranean off Bardia, east Libya (32.15N, 25.20E) - by German divebombers on the 29th June. With Inshore Squadron carrying supplies on the 'Tobruk Run' to the besieged town. Damaged evening of the 29th, capsized early on the 30th; there were no casualties (North African Campaign). WESSEX (Lt Cdr W A R Cartwright), 24th May 1940, Western Europe off Calais, northern France in English Channel - by German bombers. Supporting British land forces in the defence of Calais; 6 crew lost (German invasion of France). WHITLEY (Lt Cdr G N Rolfe), 19th May 1940, Western Europe, between Nieuport and Ostend, Belgium - damaged by German bombers and beached. Supporting Allied land forces including blocking ports and lifting off refugees; 4 crew lost (German invasion of Holland and Belgium). BLANCHE (Lt Cdr R M Aubrey), 13th November 1939, Western Europe in Thames Estuary, SE England - by German destroyer-laid mines. Escorting minelayer 'Adventure' (also mined) from Grimsby to Portsmouth. Mined one mile 80° from NE Spit Buoy, sank two hours later; two crew lost. HARDY (leader) (Capt B A W Warburton-Lee+, awarded posthumous VC) and HUNTER (Lt Cdr L de Villers+), both 10th April 1940, Western Europe, off Narvik, northern Norway in Ofotfiord - by German destroyer gunfire and torpedoes. Attacking troop transports and destroyers during the German invasion of Norway. ‘Hardy’ lost 19 crew killed in action including the CO and ‘Hunter’ lost 103 (First Battle of Narvik - Norwegian Campaign). INGLEFIELD (leader) (Cdr C F H Churchill), 25th February 1944, Central Mediterranean, off Anzio beachhead, western Italy (41.26N, 12.36E) - by German aircraft-launched, Hs.293 glider bomb. With cover force; 35 crew lost, 157 saved (Battle for Anzio - Italian Campaign). 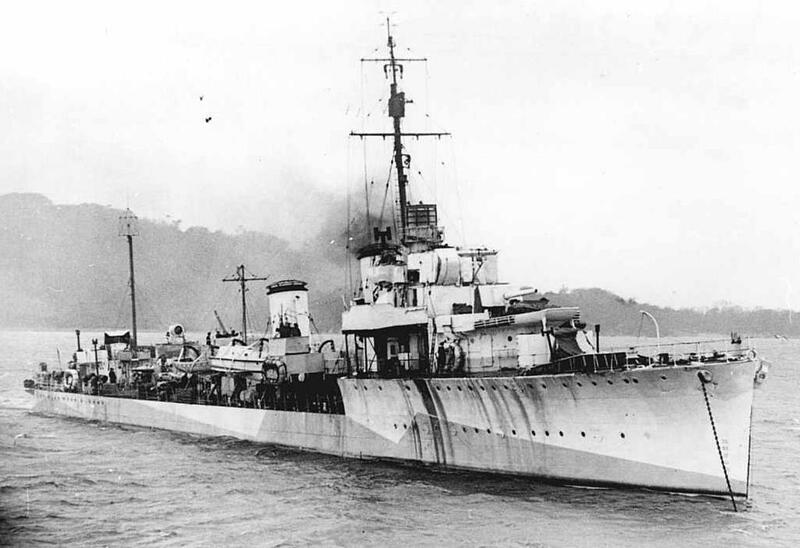 MOHAWK (Cdr John Eaton), 16th April 1941, Central Mediterranean, off Kerkennah Island, eastern Tunisia – torpedoed by Italian destroyer 'Tarigo'. 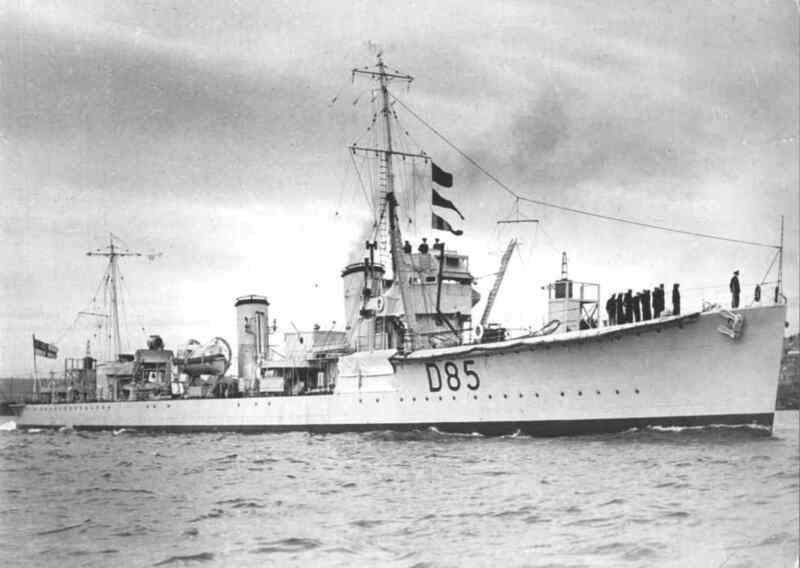 With three other destroyers in attack on five ship Italian convoy. All five ships and three escorts, including 'Tarigo' sunk. Finally scuttled by gunfire from ‘Janus’; 41 crew lost, 161 survivors (Action off Sfax - North African Campaign). JUNO (Cdr St J R J Tyrwhitt), 21st May 1941, Eastern Mediterranean, off SE Crete (34.35N, 26.34E) - by German bombers. In action with Mediterranean Fleet against the German sea-borne invasion of Crete. Hit by three bombs, sank in two minutes; 128 crew lost, 97 survivors (Battle for Crete). JUPITER (Lt Cdr N V J T Thew), 27th February 1942, East Indies, off north Java coast in Java Sea (c06.45S, 112.00E) - by mines, probably Dutch. With Australian/British/Dutch/American (ABDA) cruiser force in action; 96 crew lost, 47 taken prisoner of whom 27 died in captivity (Battle of the Java Sea - Japanese Invasion of Java). NESTOR (RAN) (Cdr A S Rosenthal RAN), scuttled 16th June 1942, Eastern Mediterranean, south of Crete (33.36N, 24.27E) – hit by German Ju.87 divebombers on 15th. With cover force for Alexandria/Malta convoy 'Vigorous'; four crew lost (Malta Convoys). CAMERON, damaged 5th December 1940, Western Europe, at Portsmouth, southern England - by German bombers. In dry-dock for refit; 14 crew killed. Reduced to experimental ship for hull stress testing. ROCKINGHAM (Lt Cdr J C Cooper RNVR), 27th September 1944, Western Europe, 30 miles SE of Aberdeen, Scotland in North Sea (56.29N, 00.57W) – believed British mine. Target ship for aircraft training, mined in 56.47N, 01.30W, taken in tow and sank; one rating killed.